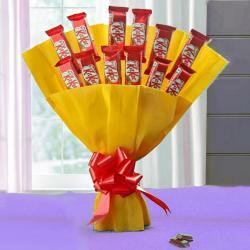 Product Consist: Glass Vase of 10 Kit Kat Chocolate in a tissue paper very nicely wrapped with Matching bow tie on it. Chocolate lover will appreciate the harmonious and lingering character of this delicacy. When you have to express your love and affection to your dear ones in a sweet manner, send them chocolates that can add extra sweetness to your relationship. 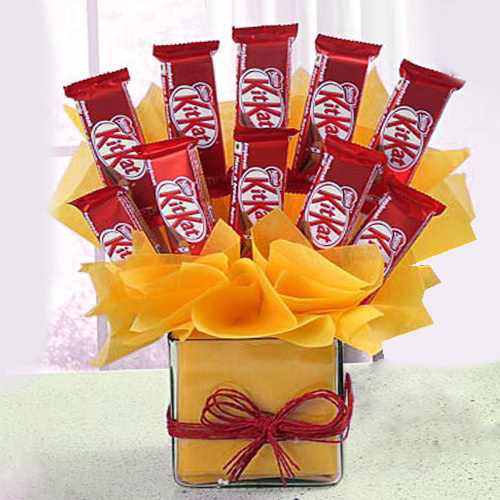 Send this amazing vase of Kit kat chocolates online on any special occasion and make your loved ones feel all the more special. 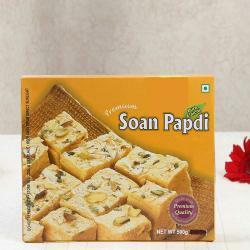 This is a Mouth-watering gift item for those who love crisp wafers in chocolates. 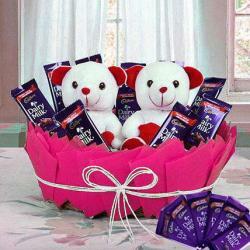 Giftacrossindia.com brings Nestle KitKat Chocolates beautifully arranged. This colorful gift is sure to melt the heart of your loved ones. Gift this Chocolates to your love ones on special occasions like birthday, anniversary, wedding, Valentines day, mothers day, fathers day, womens day, rose day, Christmas and many more. Product Includes: Glass Vase of 10 Kit Kat Chocolate in a tissue paper very nicely wrapped with Matching bow tie on it.